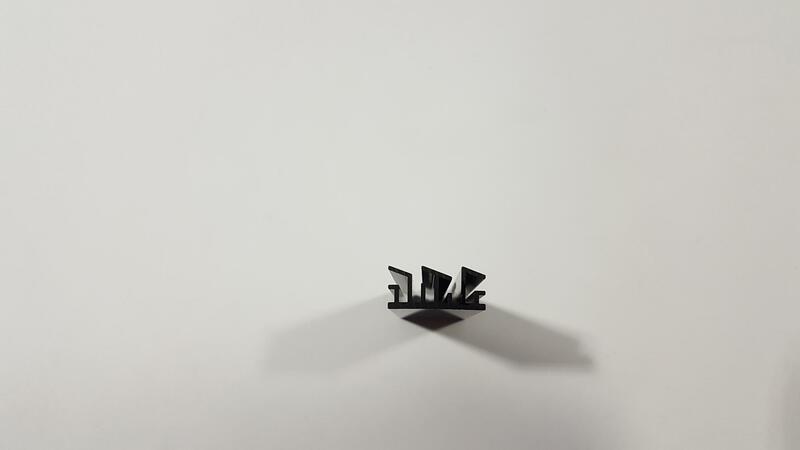 With the advancement in the technology, we are seeing the miniaturization of the components that are being packed on much less surface area. This has potential benefits but one major Con is the heat buildup as a natural consequence of this design approach. In past, we have seen many users complaining about high operating temperatures on their M.2 based SSDs which resulted in thermal throttling effecting the performance of the drives to the extent of System shutdown depending upon if the storage drive(s) were being used for main OS drives. 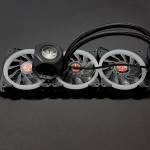 With this issue, companies like EKWB, Alphacool, GelidGC Extreme to name a few, provided a thermal solution to mitigate the heat issues by ensuring the effective heat dissipation using the thermal pads and heatsinks. 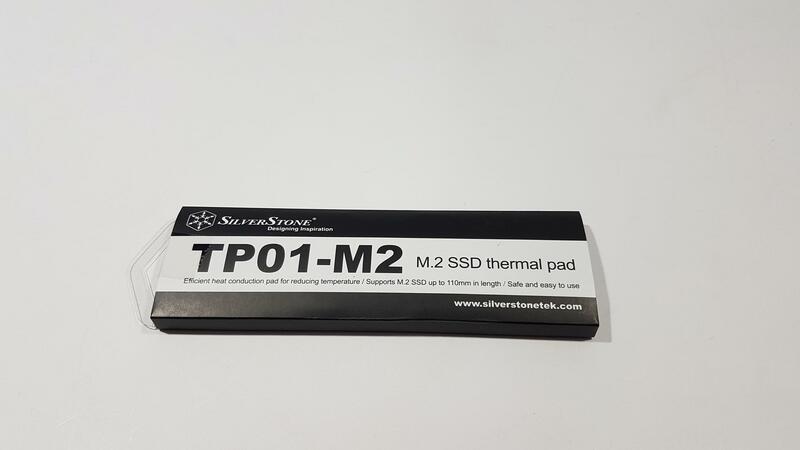 Silverstone Tek was not behind and provided a solution in the form of TP-01M2 thermal pads for effective heat dissipation. 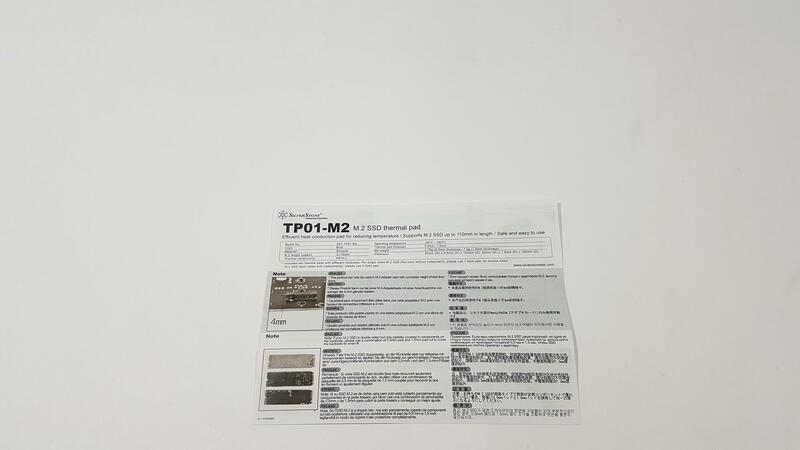 Their latest product is TP-02M2 which includes the thermal pads and the heatsink as well. Today, we will be taking a look at both products and will put them to test our Samsung PM961 NVMe 250GB M.2 SSD. The TP02-M2 comes in a transparent smart packing. The front side has a black and red color paper packing. 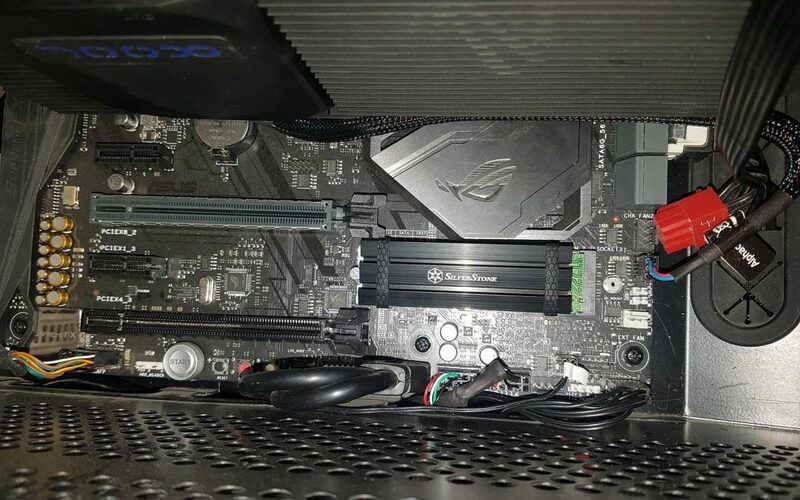 On the top side, there is a SilverStone brand logo and name printed. 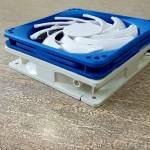 TP02-M2, M.2 SSD Cooling kit is printed on the raised surface. 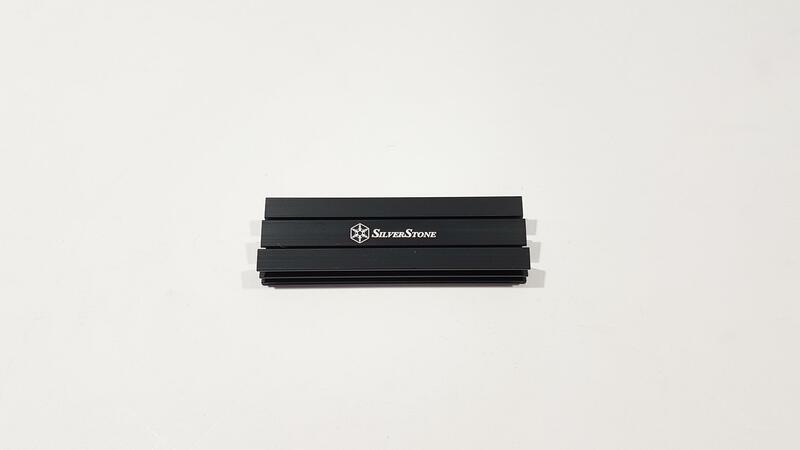 In the middle, we can see the black color heatsink with the SilverStone brand logo and name printed in the white color. On the bottom, salient features of the kit are printed in bullet format. The backside has company’s contact info to obtain technical support for the product on the top left side. The specifications of the kit are printed in the main section followed by the instruction and guidelines which user should read before proceeding to the installation part. 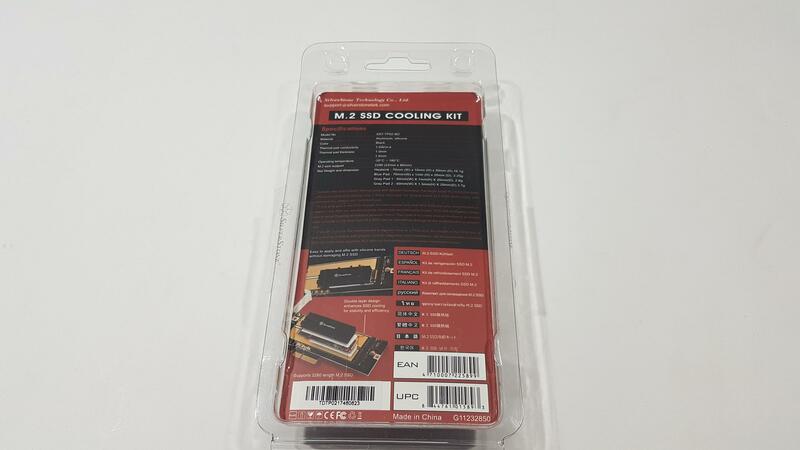 M.2 SSD Cooling Kit is printed in 11 different languages. Serial No, EAN, and UPC stickers are printed at the bottom. The transparent container has SilverStone printed seals on the left and right sides. The TP01-M2 comes in a cardboard box small size packaging. The top side is printed in the black and white color backgrounds. The top part has black color background with the SilverStone brand logo and name printed on the top left side. Model no is printed on the middle portion. The middle portion is in the white color background. M.2 SSD Thermal pad is printed on the right side. It supports M.2 SSD up to 110mm in length. The company’s website is printed on the bottom right side. The backside has Support contact information printed on the top left side. Specifications are printed on the left side. M.2 SSD Thermal Pad is printed in 10 different languages on the backside. Serial No sticker is pasted on the bottom right side along with the UPC and EAN info labels. Conformance info to various regulations is printed on the side of the box. The product is made in Taiwan. 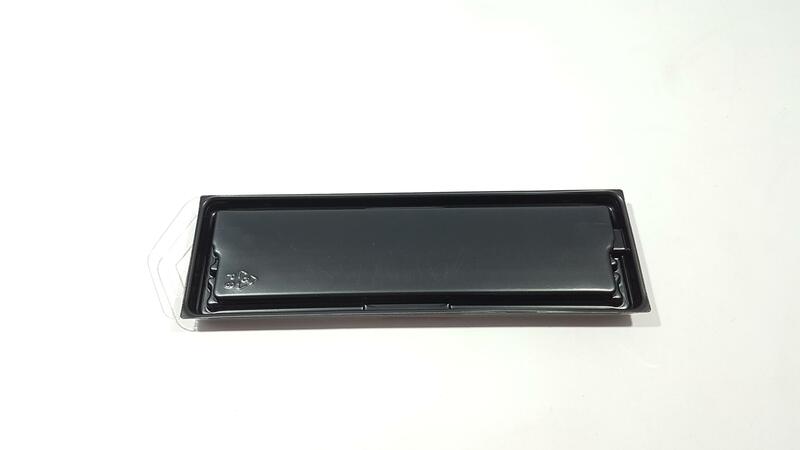 The main product is placed inside the black color plastic container which has a transparent opening cover. There is a black color foam padding covering the contents of the box. 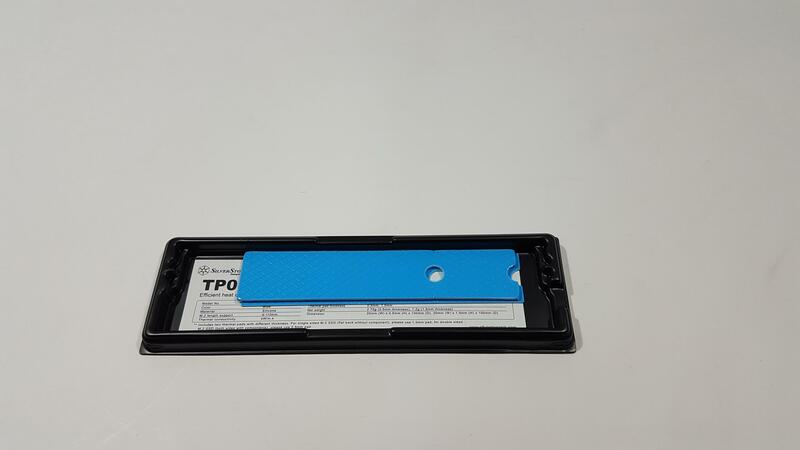 The SilverStone TP01-M2 is a solution of two thermal pads each of blue color with different thicknesses. The package has one pad of thickness 0.5mm and the other one of 1.5mm. The thermal conductivity of these pads is rated at 4W/m.K with operating temperature of -40°C ~ 200°C. They are made of Silicon material and are adhesive. Net weight of 1.5mm thick pad is 7.2g and 2.75g for 0.5mm. Dimension of the 1.5mm pad is 20mmX1.5mmX100mm (WxHxD). Dimension of the 0.5mm pad is 20mmX0.5mmX100mm (WxHxD). Supported length of M.2 SSD is ≤ 110mm. These pads can only be used in M.2 adapter card/motherboard with connector height of less than 4mm. 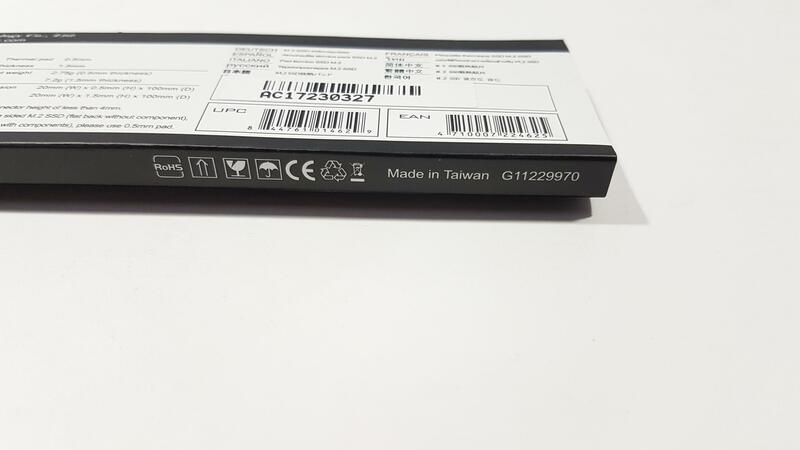 The 1.5mm pad is to be used for the single-sided SSD i.e an SSD with flat back without component whereas the 0.5mm pad is to be used for the dual/double sided SSD i.e SSD with components on both sides. 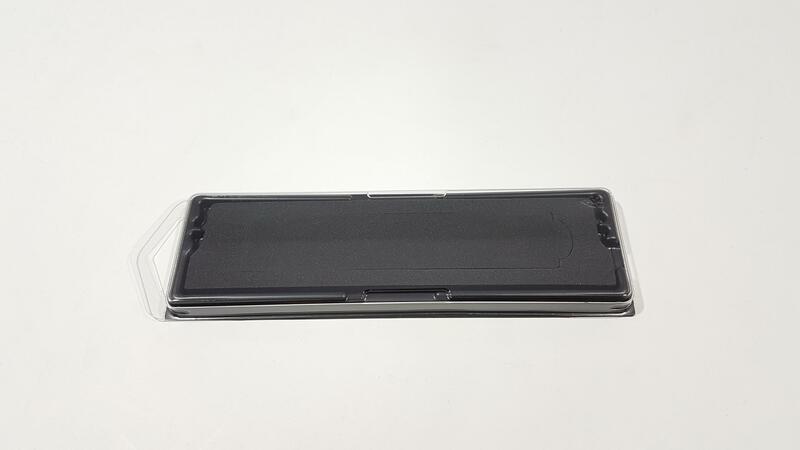 Our Samsung PM961 250GB has flat back and components on one side so we used the 1.5mm thick thermal pad. If one pad is not thick enough in making contact with M.2 SSD and motherboard/adapter card, then carefully attach both pads in the TP01-M2 kit together. Make sure that there is no air bubble left between both pads or the thermal dissipation would not be that effective. By combining both pads, we are making enough thickness to establish good enough contact for the effective heat dissipation. 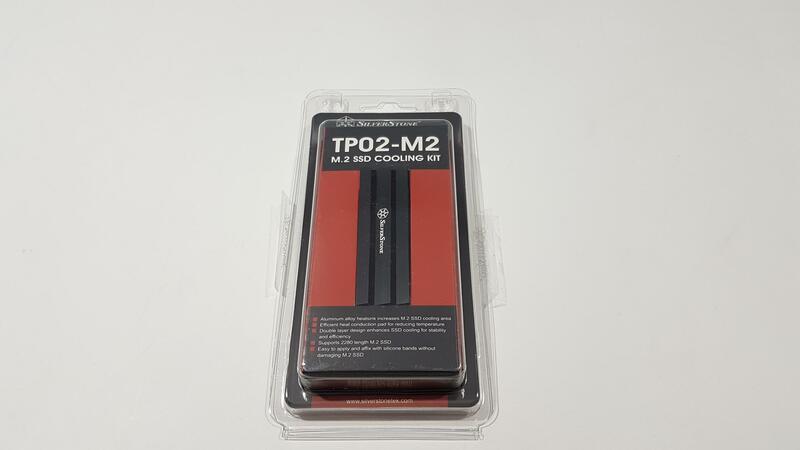 Let’s take a look at TP02-M2 kit. 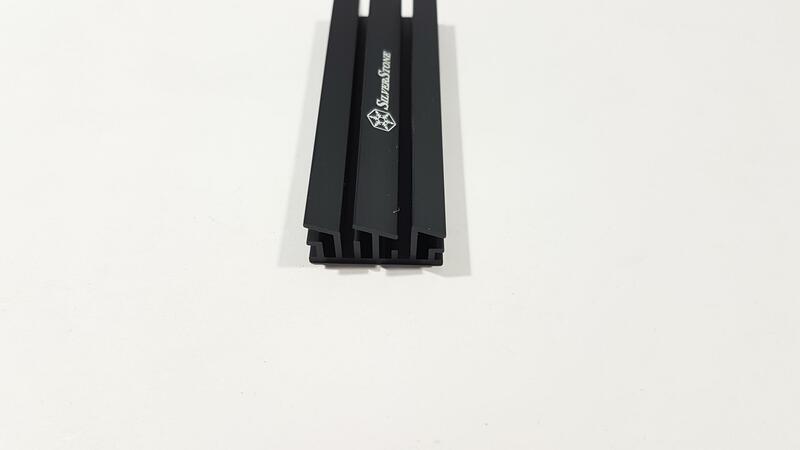 This kit has a black color beautifully designed aluminum heatsink to enhance the heat dissipation. Bundled with this kit are three thermal pads; two in gray color and one in blue color. 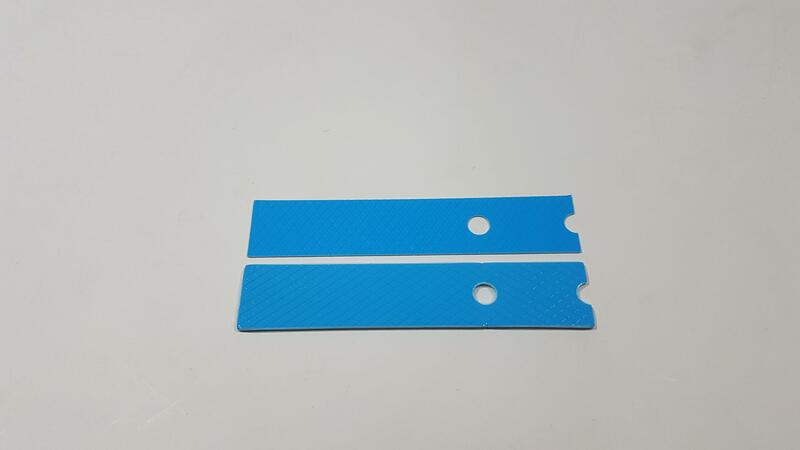 Blue pad has 1mm thickness whereas one gray pad has a 1mm thickness and the other one has 1.5mm thickness. The dimension of the blue pad is 70mmX1mmX20mm with a weight of 3.25g. 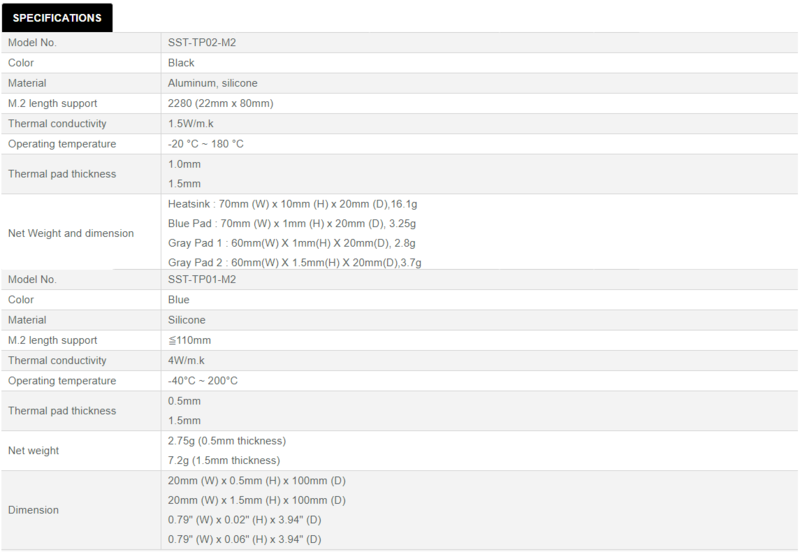 The dimensions of the gray pads are 60mmX1mmX20mm with a weight of 2.8g and 60mmX1.5mmX20mm with a weight of 3.7g. The thermal conductivity of these pads is rated at 1.5W/m.k with operating temperature of -20°C ~ 180°C. These pads are made of silicon material and are adhesive. 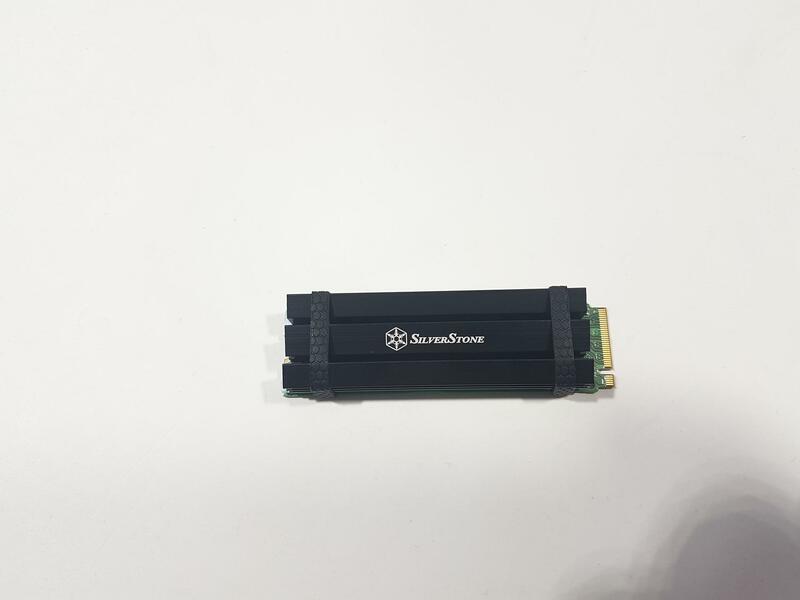 Maximum M.2 SSD length is 2280 (22mmX80mm). 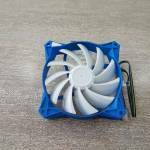 The dimension of the heatsink is 70mmX10mmX20mm with a weight of 16.1g. 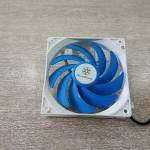 The heatsink is made of a single aluminum piece and is beautifully crafted. 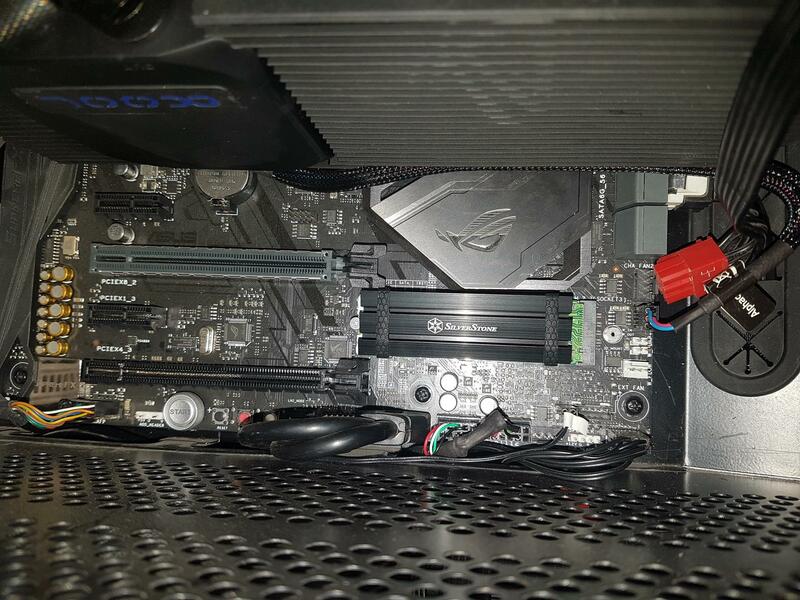 On the top side, there is a SilverStone brand name and logo printed in the white color which does add to the looks of the heatsink once installed on the motherboard. Black color adds to the neutral look and is sublime. 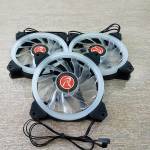 The heatsink is implemented in three layers with gaps for maximum airflow to ensure the maximum heat dissipation. The bottom side of the heatsink is brushed aluminum. Don’t forget to clean it before putting it to a good use. The left and right sides are in multiple layers as well. To set up the installation, remove the label over the SSD’s components. In case you are experiencing tearing while removing the label, heat gun would come handy. If you don’t happen to have a heat gun then use a hairdryer. Make sure not to overheat the components. Once the label is removed, take out the thermal pad from the TP01-M2 as per the single/double-sided nature of the SSD. We have used 1.5mm thick pad as our SSD has flat back with components on one side only. These pads are already cut to the 100mm and have slight cutouts on the mounting holes so that user can easily cut them to the required size. Peel off one side’s protective cover and carefully paste the pad on the backside of the heatsink so that it is aligned in equal distance from both sides. Remove the protective covering from the visible side of the thermal pad. Now, carefully, place the heatsink on the top of the SSD such that components make maximum contact with the thermal pad and making sure that left and right sides of the heatsink align with the SSD sides. Also, make sure to leave enough on both ends of the SSD so that the connector side has enough exposure for easy mounting on the M.2 port and the screw hole on the other side also remains visible. Put the Silicon bands on the left and the right side of the SSD with the heatsink. 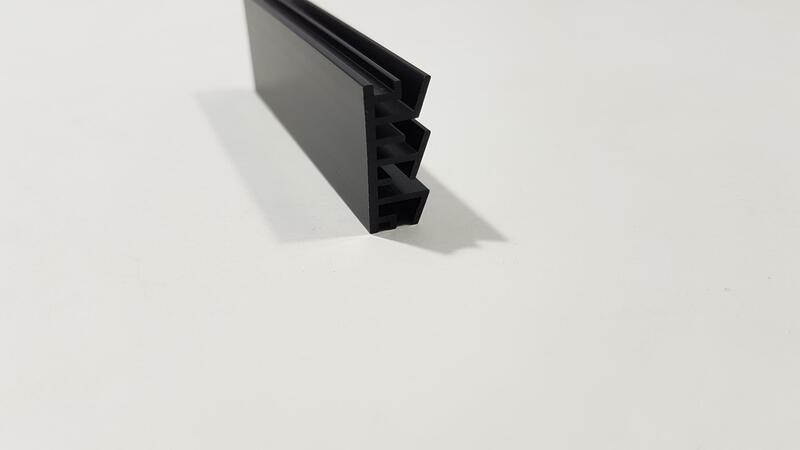 They will help in making a strong connection and to add rigidity to avoid pressure on the PCB. You are all set to use the SSD. 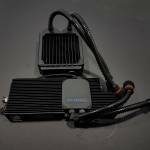 Once fully set up, the overall height of the package would be more than 18mm that would hinder the graphics card’s installation in the closer PCIe slot. So either use the other PCIe slot or use the second M.2 port subject to the availability. Testing was done using a run of ATTO Disk Benchmark v3.05. Following parameters were used for the testing. Transfer size between 512B to 64MB with a total length of 32GB and queue depth of 10. HWInfo64 version 5.74-3363 was used to monitor the temperature of the SSD. We did not use any thermal probe to monitor the controller and Memory chips temperatures separately. The Corsair H150i Pro is installed on the front side of the chassis in push/pull configuration. There are no top mounted fans. Exhaust is through the two Eiswind 12 fans on the Eiswolf’s radiator. This is to understand the airflow inside the chassis. We did not test the SSD on the open air test bench. Microsoft Windows 10 x64 build version 1709 was used. On a side note, this SSD is a boot drive as well. Let’s take a look at the results. Without heatsink/thermal pad the SSD was idling at 41°C and it topped at 61°C during the ATTO Disk Benchmark. The ambient temperature was 34°C. 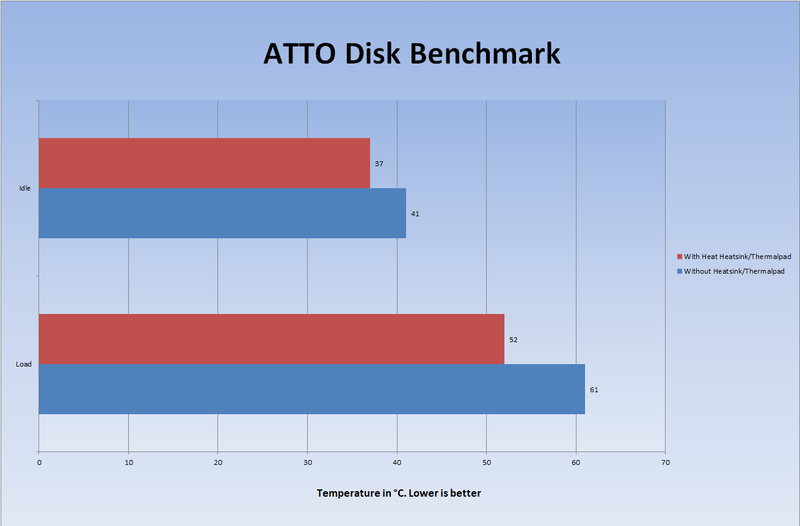 With SilverStone TP01-M2 (1.5mm thermal pad) and TP02-M2 (heatsink only), the idling temperature was reduced to 37°C and maximum temperature under ATTO Disk Benchmark was 52°C. There is a reduction of 4°C in the idle temps and 9°C under load temps. This is self-explanatory. Though the difference is not the day and night but still it is enough to give you better performance and reduce data copying time. The TP01-M2 and TP02-M2 are the SilverStone’s approach toward providing the thermal solution for the M.2 SSD cooling. Since these are first kits to be tested on our system hence we don’t have comparison data. The SilverStone TP01-M2 is a solution of two thermal pads each of blue color with different thicknesses. 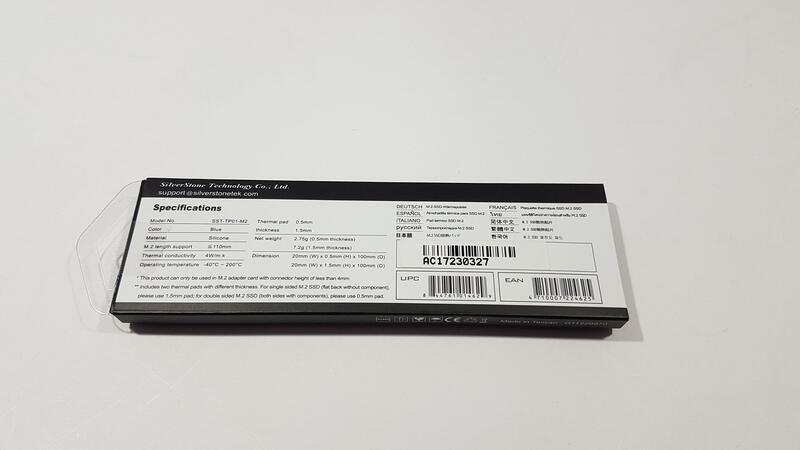 The package has one pad of thickness 0.5mm and the other one of 1.5mm. The thermal conductivity of these pads is rated at 4W/m.K with operating temperature of -40°C ~ 200°C. They are made of Silicon material and are adhesive. Net weight of 1.5mm thick pad is 7.2g and 2.75g for 0.5mm. Dimension of the 1.5mm pad is 20mmX1.5mmX100mm (WxHxD). Dimension of the 0.5mm pad is 20mmX0.5mmX100mm (WxHxD). Supported length of M.2 SSD is ≤ 110mm. These pads can only be used in M.2 adapter card / motherboard with connector height of less than 4mm. 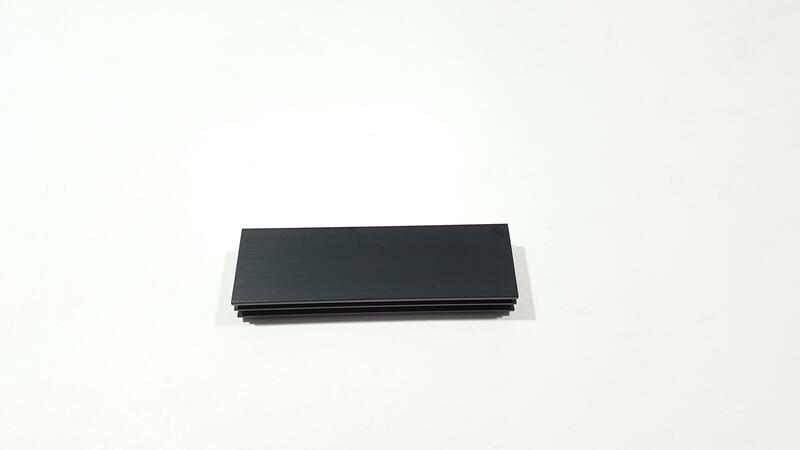 The 1.5mm pad is to be used for the single sided SSD i.e an SSD with flat back without component whereas the 0.5mm pad is to be used for the dual/double sided SSD i.e SSD with components on both sides. The TP02-M2 kit has a black color beautifully designed aluminum heatsink to enhance the heat dissipation. Bundled with this kit are three thermal pads; two in gray color and one in blue color. Blue pad has 1mm thickness whereas one gray pad has a 1mm thickness and the other one has 1.5mm thickness. The dimension of the blue pad is 70mmX1mmX20mm with a weight of 3.25g. The dimensions of the gray pads are 60mmX1mmX20mm with a weight of 2.8g and 60mmX1.5mmX20mm with a weight of 3.7g. Thermal conductivity of these pads is rated at 1.5W/m.k with operating temperature of -20°C ~ 180°C. These pads are made of silicon material and are adhesive. Maximum M.2 SSD length is 2280 (22mmX80mm). The dimension of the heatsink is 70mmX10mmX20mm with a weight of 16.1g. We have tested the 1.5mm thick thermal pad from the TP01-M2 with the heatsink from the TP02-M2 on our Samsung PM961 250GB SSD. 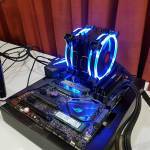 Once the SSD is setup with the thermal pad and the heatsink, the overall height of the package would be more than 18mm that would hinder the graphics card’s installation in the closer PCIe slot. So either use the other PCIe slot or use the second M.2 port subject to the availability. The SilverStone TP01-M2 is rated at $9.99 and TP02-M2 is rated at $15.99 at the time of the review. 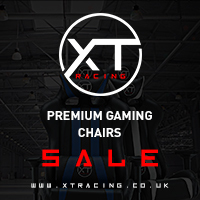 Given this price and the performance they offer, it is a good buy. 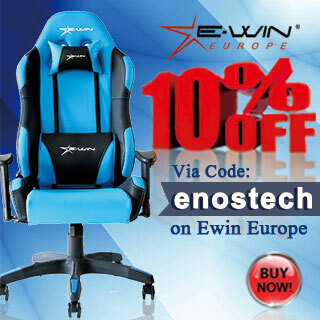 The build quality is top notch and we did not observe any reportable issue with the products. 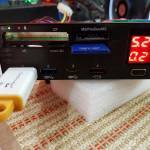 Their combination had driven the idling temps down by a margin of 4°C and load temps by the margin of 9°C which is good enough to drive any SSD’s cooling need and keep in mind that we did not test the kits in an open air system but inside a closed system. 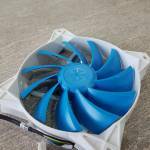 We have provided the fans configuration to have an idea of the airflow inside the chassis in our testing section. 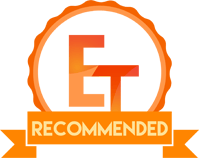 These kits come recommended by us. 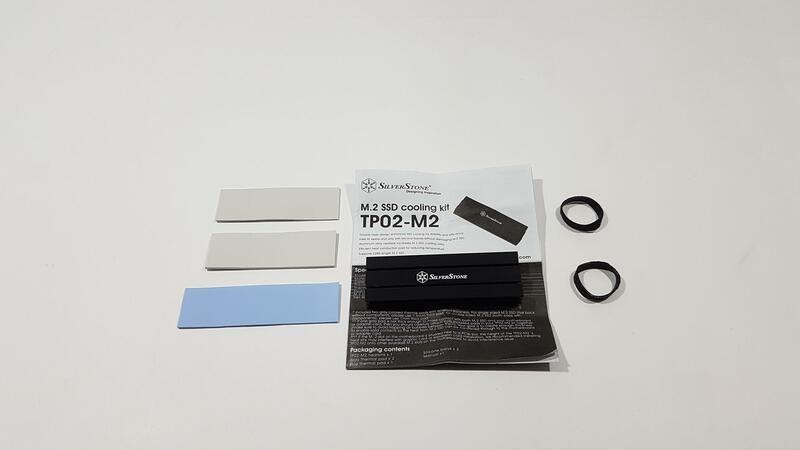 We are thankful to the SilverStoneTek for giving us the opportunity to test review their TP01-M2 and TP02-M2 cooling solutions for the M.2 SSDs.